Huber Technology provides state-of-the-art stainless steel equipment for the municipal and industrial water and wastewater markets. Huber Technology has been developing technology for the water and wastewater treatment industries for 175 years, and we are pleased to present one of their latest innovations; the RoS3Q Screw Press. The RoS3Q Screw Press is a conical screw shaft with cylindrical sieves consisting of three treatment zones: inlet and drive zone, three-part thickening and dewatering zone, and press zone with pneumatic counter-pressure cone. In the first part of the thickening and dewatering zone the filtrate is quickly removed via a large free filter surface at a low primary pressure. A pressure probe in the feed area controls the primary pressure thus ensuring a constantly high filtrate quality. 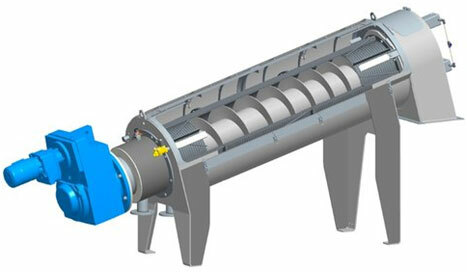 In the second part of the screen the volume of material between the screw flights is reduced by the conical screw and the sludge pressed against the inner screen surface so that the sludge is dewatered, with a continuous increase of filter cake thickness. The screen apertures are much smaller in this screen section. In the third part of the screen the residual water is pressed out of the sludge, at a minimum filter cake thickness, by the pneumatic counterpressure cone at the press discharge. 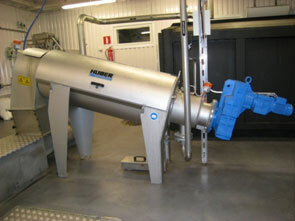 The dewatered sludge is pushed by the conveying screw past the pressure cone into the discharge chamber. The sludge residence time in the screw press and thus the filtration time can be adjusted to individual requirements by adjusting the rotational speed of the screw shaft. Low Maintenance, Operator Friendly: Operating at a maximum speed to 1.5 rpm, there is very little wear on the machine. The unit can be operated unmanned. Reduced Operating Costs: Less installed horsepower and polymer consumption than other dewatering technologies. High Capture Rates and Cake Solids: Capture rates exceeding 95% and typical cake solids of 18-24% and higher depending on the characteristics of the sludge. Pelton Environmental is proud to represent Huber Technology in Ohio and Kentucky. If you would like to learn more about the Huber's complete product offering or the RoS3Q Screw Press, please feel free to contact us or you can visit Huber's website at www.huber-technology.com.